A programme where Young People give real money to Young People’s projects to benefit Fingal. The grant is designed to promote young people’s creativity and abilities to innovative and develop projects that positively impact and enhance Fingal community. Projects developed must fully meet our committee priorities for this grant round. Grant award for this programme must originate and be Youth-led but can jointly be implemented under the supervision or assistance of an adult leader acting as a tutor, mentor, facilitator or general support to catalyze the process. YBF- YouthBank Fingal, consist of a team of trained young people and their coordinator who manage the grant process. 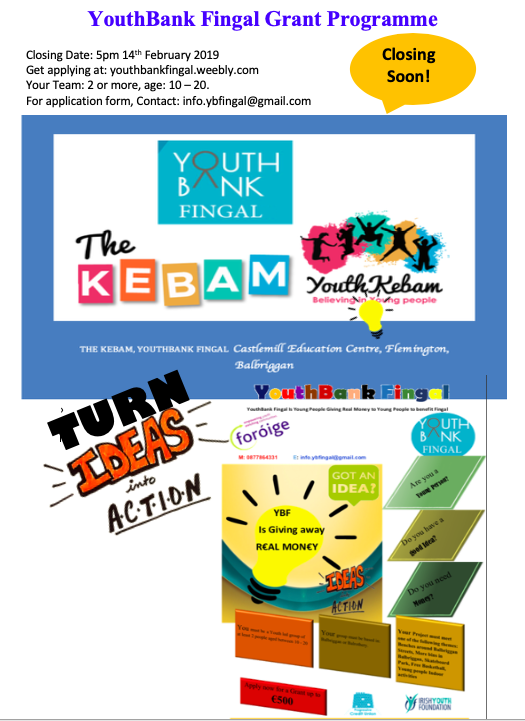 The Kebam or YouthKebam- Empowers the whole process of grant making in partnership with the Irish Youth Foundation, Foróige and Progressive Credit Union. YBFGP- YouthBank Fingal Grant Programme; defines the principles and process of the grant programme. Grant Committee- refer to the team of young people responsible for the grant process; to include promotion of the programme, receipt of application, screening of application, interview process, decision on team(s) who get the award, issue of award, monitor and evaluate the process. Pease see programme guide and website for more information. The Grant process ends by 21 May 2019.